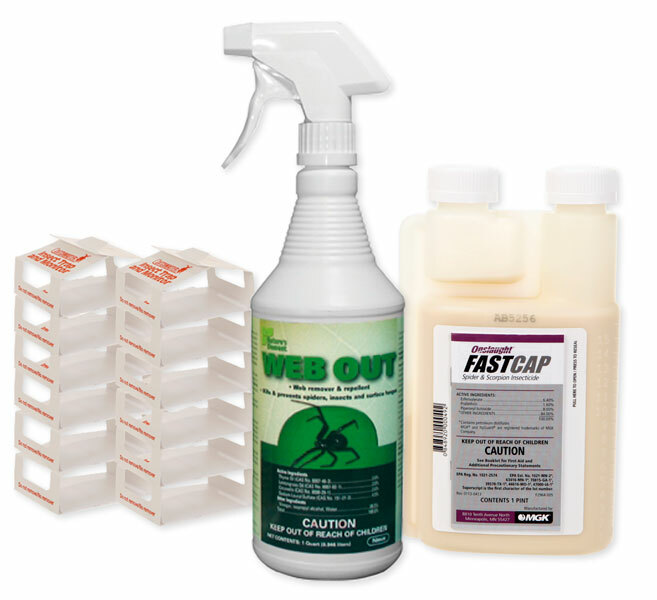 Onslaught Fastcap is sprayed outdoors around the perimeter of the home and also into any crack or crevice where scorpions or spiders could enter. It is also sprayed indoors along baseboards under furniture and in corners of rooms, etc. ePest IPM Traps are then placed under furniture along walls, and in hidden areas to capture them. Webout is for spiders and is sprayed in corners of rooms where spider webs tend to gather. It can also be sprayed directly on spiders to kill them. Onslaught fastcap is a fantastic product and really works well. By just spraying it and then putting out bug traps, you can kill and capture most scorpions and spiders. Do this every 30-60 days during the spring and summer months for best year round protection. Fastcap makes about 32 gallons of spray, more than enough for the entire year for most average size homes.